We’d love your help. Let us know what’s wrong with this preview of Ryan's Legend by L.F. Young. When Ryan discovers strange tracks outside the old chicken coop in his backyard, his curious nature leads him on an amazing adventure. He knows he shouldn’t keep secrets from his parents, but if they knew where he spent his days, they’d ground him for life! In a room underground, Ryan learns to communicate with a mythical creature. Through these chats, he begins to understa When Ryan discovers strange tracks outside the old chicken coop in his backyard, his curious nature leads him on an amazing adventure. He knows he shouldn’t keep secrets from his parents, but if they knew where he spent his days, they’d ground him for life! In a room underground, Ryan learns to communicate with a mythical creature. Through these chats, he begins to understand the importance of nature, loyalty, and stealth. To ask other readers questions about Ryan's Legend, please sign up. Ryan’s Legend is a great story ready to read by young children for the holiday break. It’s filled with mystery and likeable characters while being delivered in a fast-paced easy to read style. L.F. Young makes his story compelling in that he gets us straight to the heart of the story. I liked the viewpoint of Ryan because it felt like I was looking over his shoulder, and like Ryan, I worried that someone would find out his secret. I can relate to Ryan because I also have an older brother that wou Ryan’s Legend is a great story ready to read by young children for the holiday break. It’s filled with mystery and likeable characters while being delivered in a fast-paced easy to read style. L.F. Young makes his story compelling in that he gets us straight to the heart of the story. I liked the viewpoint of Ryan because it felt like I was looking over his shoulder, and like Ryan, I worried that someone would find out his secret. I can relate to Ryan because I also have an older brother that would do anything to get me in trouble. Unlike Ryan, I don’t have a secret as awesome as his. The end of the book leaves a lot of open doors for future stories. I’m curious what Ryan will do next, and wonder if his secret will take him on journeys away from his “cabin” and family. I would rate this story 4.5 out of 5. There were a lot of cool ideas brought up, and I would have liked to see them fleshed out a bit more to give a 5 out of 5. Sometimes, I almost felt that one or both of the parents knew what the secret was. Overall, if you’re looking for a short read that will hold a young child’s attention, this is one for you. This is a lovely little story about a boy, a mythical friend with a difference, an annoying brother and an old wooden chicken shed. I really enjoyed it and hope the next book comes out soon to find out what happens next! An enchanting story, perfect for any child's bookshelf! Ryan's Legend is a book you could read to your children or grand children. Its the story of a young lad, Ryan, who, like many young boys, gets in trouble more times than he should. it doesn't help having an older brother whose a bit of a bully. But Ryan's life is about to change. Something strange is happening around the old chicken coop, and Ryan is determined to find out what. This book was well written and easy to read. It has a very Canadian feel to it with a wintery setting, but also 'having Ryan's Legend is a book you could read to your children or grand children. Its the story of a young lad, Ryan, who, like many young boys, gets in trouble more times than he should. it doesn't help having an older brother whose a bit of a bully. This book was well written and easy to read. It has a very Canadian feel to it with a wintery setting, but also 'having your own cabin', a very Canadian sentiment. One among many. There are some nice lessons about the environment here too, again very Canadian. This is a delightful book about a little boy and his secret, legendary friend. At ten, Ryan knows he shouldn't keep secrets from his parents, but when his new friend's life depends on it, he goes to great lengths to protect him. Ideal for emergent readers, "Ryan's Legend" draws the young reader into the story,using kid-friendly language, and just the right pacing. I can't wait to see the final product, complete with illustrations. Ryan's Legend is a wonderfully written, environmentally conscious, feelgood children's book that leaves you with that "fuzzy feeling" inside. I am 44 years old, but reading this I was delightfully brought back to an innocent time of my childhood when things like having a dragon as a friend were worth much more than money or success. Read this for yourself (guilty pleasure) and your kids will love it too! You can't help but like this story. Mr. Young is a down to earth writer and keeps you interested.. You don't have to be a young adult to enjoy this tale. I liked it and recommend it. This was a fun, solid kids story, fast paced with likable characters. I'm looking forward to the launch of the sequel later this week. I would recommend it for boys or girls. A fantasy tale all children will enjoy! One of my son favourite saying 'cool story bro needs more Dragons' not in this case! It's exciting to find a story that can be enjoyed by boys and girls alike and yes it has Dragons!! environment and loyalty between friends.. If you have a child that's looking for a new read then I would not hesitate to recommend this fantasy story by L.F. Young. Make this their first chapter Book introduce them to the world of fantasy. 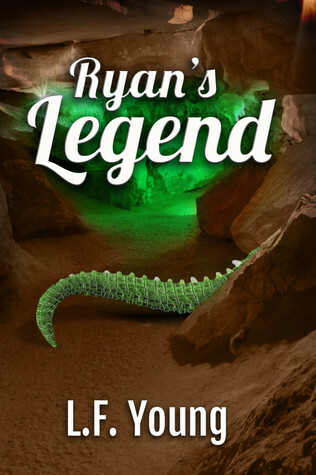 Ryan's Legend is a short story for young children, Ryan is ten years old and this book mixes adventure, mystery and fantasy. When Ryan spots a green tale disappearing inside the old chicken coop he wants to investigate. He finds the opening to a tunnel and bravely sets off on an adventure that leads to the discovery of a new friend. An easy read and the first book in a series which should appeal to young readers. A beautiful little book filled with whimsy and magic. A must read for any child! Ryan's legend is a sweet story of friendship between a boy and a very special magical being. I read this book a while back. Yes I'm tardy in my reviews, sorry Mr. Young. I thoroughly enjoyed this fantasy and I can hardly wait until my grandson is a bit older so that I can read it to him. Now what I need to find out is whether this and subsequent books are available in hardcopy. I am a retired Plumber. I enjoy writing and fishing as hobbies. In my spare time you will find me enjoying a good book, watching Television, or banging away on the keyboard at my favorite pastime, writing. I live in Rural New Brunswick with my wife and lots of rescued pets. I am also a proud father to 2 sons, both in the Canadian Navy. Ryan's Legend was written in 1995, and published 18 years later I am a retired Plumber. I enjoy writing and fishing as hobbies. In my spare time you will find me enjoying a good book, watching Television, or banging away on the keyboard at my favorite pastime, writing. Ryan's Legend was written in 1995, and published 18 years later by a great publishing house, Morning Rain Publishing.